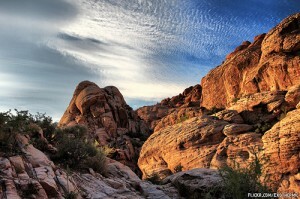 Red Rock Canyon National Conservation Area: This great area is one of the most fantastic places in southern Nevada. Red rock formations are everywhere and there are places where the red sandstone alternates layers with gray limestone in sheer cliff faces. horseback riding, hiking, and rock climbing are popular in this area. Spring Mountains Recreation Area: If you want to visit a big mountain and lots of wildlife, come here. Animals regularly seen in the area include tortoises, wild horses, elk, foxes, deer, coyotes, bobcats, and various birds of prey. The big mountain, Mt. Charleston, offers skiing and snowboarding during the ski season. 100 neighborhood and village parks. Cycling trails and bicycle lanes. Trail system with over 150 miles of trails. Ongoing development should extend the trails to about 200 miles and connect them to 2,000 miles of other existing trail systems. If renting Las Vegas apartments, with all their glamour, is just too much to handle, consider moving to Enterprise or Summerlin — these wonderful communities lie on the edge of civilization and offer you the great outdoors as your new back yard.